Christian Wolfarth has been performing solo since 1991. Reduction plays an important role in his music, as does an obsession for detail and an impressive palette of sonic possibilities that the drummer has been developing over the past 20 years of intense solo-playing. In his solo project, he just uses a number of cymbals. 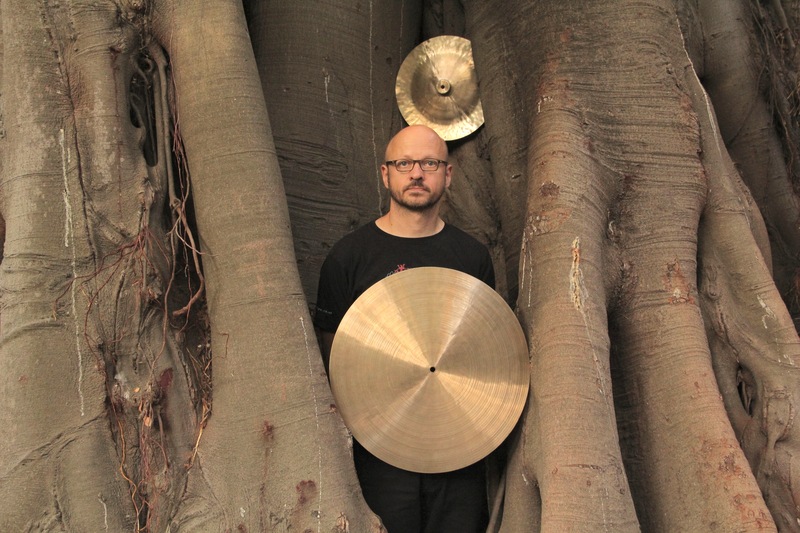 He has also performed in ensembles with the following improvisers: John Butcher, Bertrand Denzler, Axel Dörner, John Edwards, Urs Leimgruber, Irène Schweizer, Evan Parker, Paul Lovens and many others. His releases have appeared on labels as diverse as Presto! ?, Monotype or Mikroton. He was nominated for SHAPE by the Skanu Mezs festival, where he will play on 10 October. You trained as a cook, how did you get into music? Do you see any parallels between music and cooking? Christian Wolfarth: It wasn’t really my wish to become a cook. It was the idea of my father. I had always been interested in becoming a musician or an actor, but I’d never played an instrument. My father would give me some tapes to listen to when I was very young, a lot of rock and jazz. That was a real gift. I learned quite a lot about music that way. I do not see any parallels between music and cooking, but sometimes both of them are connected with creativity. But a lot of percussion players are very good cooks. Can you talk about the aesthetics of your work (the influence of reductionism and minimalism and electronic music), as well as various contexts that your music can be placed in (from the electronic scene to jazz to improv)? CW: In the last 35 years, I’ve played and listened to a lot of really different music. For sure, electronic music is – at least for my solo music – an important influence. In general also the field of reductionism was important for me. For the other projects, the whole jazz history and rock music are of relevance. There are too many interesting things around and I am influenced by all of them. You mention that you never use electronics and want to express yourself with acoustic instruments only. Why is this? CW: I just do not see the necessity to use electronics, there are more unexplored aspects in my acoustic instruments. And I try to go deeper inside the instruments and the music. I don’t like a lot of contemporary electronic music because I think that a lot of people do not take it seriously enough. Why and how have you chosen the cymbal as your primary musical instrument and what is the most appealing aspect of this musical instrument for you? CW: I only use cymbals for my solo project and for some small ensembles. In general, my set is a bit bigger, but still very small; just two snare drums and three cymbals. I have enough possibilities to express myself and it’s great for traveling. And ever since I was a child, I’ve loved the sound of church bells. It’s interesting that cymbals and church bells are made of the same material. That’s also a reason why I choose the cymbals. How do you build up your music and live shows, what is the importance of silence/gradation? CW: I try to play in a compositional way. For sure, silence and gradation and a lot of dynamics are very important as well as the duration of a piece or a live set. Can you compare improvising solo vs improvising in a group? What is different for both the players and the listeners? CW: It’s not that much about improvisation when I play solo. It’s a kind of a (for sure, not fixed), composition. I mean, also in group improvisation, the compositional aspect is always very important to me. I try to remember the used materials of the group members, the functions and the form. I don’t know exactly what is the difference for listeners and players, but I think, the more clarity I can reach in a group improvisation, the more clarity and pleasure it is for the listener. Can you talk about the musicians you have played with over the course of your career? Have you had improvised encounters with musicians that you have learned a lot from? CW: I try to learn from every musical situation, but sometimes I try to avoid certain ones. I learned a lot from my teachers. Nowadays I learn the most from the musicians of my working bands because there is a big understanding for each other and a lot of confidence. I am not a big fan of ad hoc ensembles. Is there anything specific in other forms of improvised music that you feel you have to remove yourself from? Would you agree that a lot in this field of improvised music has to do with considerations like not doing something, holding oneself back from certain activities and gestures? CW: I just try to play when I have the impression that a musical gesture and contribution makes sense in that moment, otherwise I try to shut up. I hear a lot of not really important notes in some improvised music. But I cannot exclude myself – it’s not that easy to only play the right notes at the right time. Can you talk about the music scene in Bern that shaped you, as well as your formal education with Billy Brooks, etc? CW: I moved to Bern for my studies at the Swiss Jazz School in 1981. I wasn’t too sure whether to become a jazz musician. It’s funny, the first bands I had in Bern were rock groups. I found myself in a Rolling Stones cover band and in blues and art-punk bands, for example. At the same time, I also played a lot of jazz in different settings – from a piano trio to a big band. The years at this school were a bit strange to me, I felt a bit on the outside in a way. On the one hand, I tried to be a part of this jazz scene and I was increasingly interested in contemporary and improvised music and in music which I’d never heard before. There was this incredible concert series called “Jazz Now Bern”, which was really fantastic and important to me. It went on from mid to the end of the eighties. They organised a lot of great shows from the AACM in Chicago, the New York downtown scene, the whole scenes from Germany and the GDR, a lot of great English, French, Dutch and Swiss musicians. In 1986, I became a member of the WIM Bern, an association for improvised music. They organized weekly sessions and I was always there. A bit later, I started to work for the association; organising concerts and festivals, printing flyers, etc. Beside of all of this, I studied with Billy Brooks for more than four years. He was incredible, too, quite strict, I had to practice a lot. Around 10 years later, the same thing happened with Pierre Favre. He was also very important and very supportive of me. It was at this time that I worked on my first solo CD. That was around 1995. You also have your own label called hiddenbell records. CW: I started to run the label to release my acoustic solo perecussion series of four 7″ vinyl singles in 2009. Then I did a collectors box with these four singles with a booklet with texts by four friends an pictures by myself. The next release was a double CD with this material on the first CD, and a CD with remixes by Günter Müller, Joke Lanz, Hans Joachim Irmler and Rashad Becker. The last CD was “Scheer”, played only with cymbals. My goal is to open the label for percussion music.